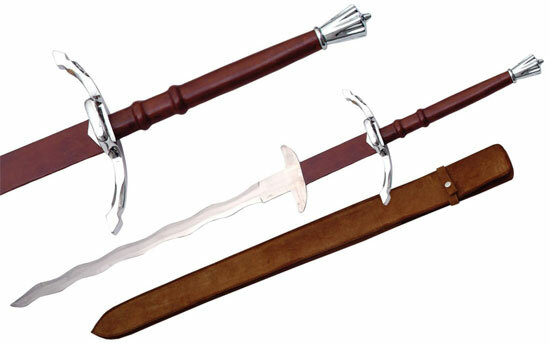 Medieval Flamberge Swords for sale are 50 5/8th inches in all. The popular Flamberge is inspired by real medieval two handed swords that featured a flame shaped blade. This modern version features a large guard and a 29 3/8th inch stainless steel flame shaped blade with a display-ready factory edge. The guard and pommel are crafted of polished metal. The ricasso features parrying hooks. The oversized handle is wrapped in brown leather and matches the brown leather scabbard. Buy the medieval Flamberge Swords for $129.99.